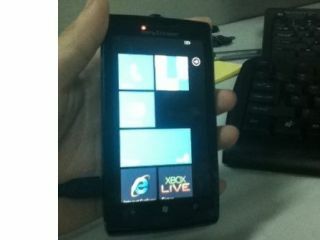 Windows Phone: the new OS of choice for Sony Ericsson? Sony Ericsson may not have jumped onto the Windows Phone bandwagon as keenly as other manufacturers, but it looks as though the company is slowly clambering aboard. Photos of a prototype Sony Ericsson phone running the Microsoft OS have emerged, fuelling the rumours that the company is getting ready to launch a Windows Phone. The handset itself looks like a touchscreen phone with a landscape slide-out QWERTY keyboard, which looks quite shallow-set although the keys have acres of space between them (or thereabouts). The standard back, menu and search buttons reside at the bottom of the screen, while the now-familiar Windows Phone tiles adorn the large screen. It's not exactly breaking any new design ground and the overall feel is quite PDA-esque; but this could be because it's a prototype and therefore unfinished. We can't comment much on specs, but there's no doubt it will meet Microsoft's relatively high minimum specifications – and from the images we can see a micro-USB connection and what could be a front-mounted camera atop the device. The emergence of this prototype comes as no great surprise; Sony Ericsson has long been rumoured to be looking at Windows Phone as a viable OS, and would support hints made by the company to TechRadar at Mobile World Congress this year. Nathan Vautier, UK MD of Sony Ericsson, told us, "We're not as tribal about ecosystems as some companies. We believe that the Android environment is the best and most mature ecosystem for us at the moment; but we have a good working relationship with Microsoft."